Darts is a fun game, but it can also be a dangerous game if you are not careful. Some dartboards require to use steel tip darts which are sharp and pointy at the end. These tips are meant to penetrate through dartboard surfaces made of bristle or rubber. But if the darts fall onto the flooring, the tips could easily damage it. That is why you need to use dart mats to protect your flooring. Before searching for the best dart mat, you need to understand the circumstances more first. Why I Need a Dart Mat? Professional players use steel tip darts like these all the time in competitive settings. On the other hand, recreational or novice players may just purchase an electronic dartboard for their basement and play with soft tip darts. There is no danger from soft tip darts because their tips are round and don’t stick into anything. But if you bring a professional dartboard with steel tip darts into your home, then you need to make certain preparations. To Protect Floor: The biggest danger of playing with steel tip darts is their ability to damage your walls and floors. Now you can easily protect your walls by putting a backboard behind the dartboard, but what about your floors? If you’re playing somewhere with wooden or tile flooring, these sharp darts can damage it after a short while. Each time you throw a dart and it bounces onto the ground, the tip of the dart could inadvertently mark up the floor. After this happens enough times, your flooring will be ruined. Then you will be forced to replace it entirely, which will cost you a lot of money. By placing a dart mat on the floor, it will shield the flooring from the sharp tips of the darts. Then it can stay protected with each darts game that you play. Competition/Throw line: Dart mats contain a marked toe line which indicates where players are supposed to stand before they throw. If a player steps over the dart mat throw line as they throw their dart, then any points they score are not supposed to be counted. Without dart mats and throw lines, it is impossible to know where the precise toe line is located. If you’re a darts player who is training for a professional competition, then you need to start practicing your throws while staying behind the dart mat throw line. What Should I Look for When Buying a Dart Mat? The dart mat for your room depends on the type of flooring you have. For instance, if you have wooden flooring that you want to protect, then a dart mat made of rubber will be perfect for it. However, if you have carpeting on your floor that you want to protect, do not use a rubber dart mat because it will move around too much. Try using a nylon-based dart mat as an alternative to the full rubber mats. That will be better for carpets. Home Dart Mats – Home dart mats are typically designed to be used on carpets, vinyl tiling, or wooden flooring. These mats will likely be made of either rubber, vinyl, nylon, or a combination of two or more of these materials. They should have the throw lines marked on them too. Industrial & Commercial Dart Mats – The industrial and commercial dart mats are designed for professional and competitive settings. These mats are more “heavy-duty” than the home dart mats. This means they are thicker and bigger in size. The throw lines will clearly be marked as well. Floor Dart Mats – Floor dart mats cater to specific types of flooring. You might find dart mats made specifically for protecting wooden flooring or vinyl flooring. If you care about this added protection for your particular type of flooring, then look for these floor-based dart mats. Wall Dart Mats – Not all dart mats go on the floor. If you want to protect your walls too, you can purchase wall dart mats to place all around your darts room. That way, if you throw a dart and it hits the wall, you won’t scuff the drywall or whatever other material it’s made of. You have already got the idea why you need a dart and how you can pick to consider different factors. I have reviewed here 5 dart mats that meet your expectation. This rubber dart mat is endorsed by US National Champion Chris White. 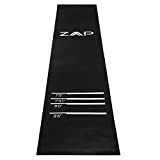 Its high-quality design, perfect measurement, nicely graphical throwing/toe lines, and heavy-duty performance make it one of the best dart mats. It is ideal for home dart mat, competition dart mat, and floor dart mat. It doesn’t only protect your floors from damage but also guides you where to stand for throwing. THROW LINES- This mat includes easy to see, official soft tip dart and steel tip dart throw lines. NONE CURLING- Measuring out to be 9ft 9" (2995mm) L x 2ft (625mm) W the Shot Dart Mat does not curl up at the ends! Top Quality: The Shot! Dart Mat is manufactured with industrial grade rubber that makes it very strong & long-lasting. Plus, it is non-slippery with the professional graphic design, adds protection to save bounce outs for both soft and steel tip darts. Official Endorsed Throwing Lines: It is not crummy words if I say for better throwing you have to stand in the right place. This professional dart mat has clearly visible official throwing lines both for soft & steel tip darts. As a result, you need not to worry about finding the right place to stand. Multi-Functional Usability: It measures an impressive 2995mm in length and is 625mm wide, making it the best mat for any purposes. For instance, you can use it as a professional home darts mat, commercial darts mat, floor darts mat or wall darts mats. Another fact is that it doesn’t curl up at ends while rolling out. 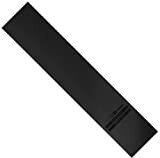 No Hassle: This heavy duty darts mat is easy to roll up and keep in any cabinet or on a shelf. Non-slipper saves reduce bounce-outs for darts. Easy to see the throwing lines. Ideal for both soft & steel darts. It is worth for every penny. You can not use the reversible part. Does not ship to all countries in the world. 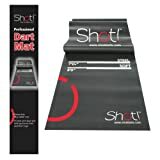 Final Thoughts: The quality, multi-functionality, and graphic designing undoubtedly make it a top dart mat whether you use soft or steel tip darts. I am sure buying it will give you a lot of satisfaction and joy. If you are looking for the best quality, heavy duty dart mat with perfect measurements and clearly inscribed throwing lines, then this budget dart mat definitely is for you. Its excellent features have made it one of the best professional dart mats you can get. It eradicates the tensions you have while playing darts without a dart mat. Great Quality: It is wrought with heavy rubber that makes it heavy duty and much stronger than soft dart mats. Whether you play with soft or steel tip darts, this dart floor mat rubber protects the floor and the darts from damages. Oche Lines: This floor protection dart mat features four beautiful, clearly visible throwing lines. Of the four lines, the two regulation distance embossed toe lines are for the soft tip and steel tip darts. So, these lines serve as guides and are very helpful, as the importance of correct positioning in darting cannot be overstressed. Ideal Size: This dart mat has the perfect measurement for the throwing lines, and its overall dimension makes it ideal for home and tournament use. It’s easily foldable and easy to store in any cabinet or on a shelf. Comfortable Hitting Experience: This mat is not only durable, but it is also not slippery. The anti-slip quality stabilizes the mat, preventing it from moving while you throw. Due to that, you will get the best comfortable hitting experience that also encourages your throwing. Ideal for soft & steel tip darts. You can feel bored for the rubber smells. The Viper Padded Dart Mat definitely lifts your throwing spirit. The throwing lines add elegance to the dart mat. It increases your playability in a standard way that is very important if you intend participating in tournaments. Quality: This dart mat throw line has good building quality that is made of soft cushioned vinyl. One of the principal reasons for using a dart mat is to protect the floor, and it serves that purposes perfectly. It is the best for soft tip darts players, but not so great for the steel tip darts users. Embossed Toe Line: The dart mart has two toe lines inscribed at official throwing line distances. The Soft & steel tip toe lines help to habituate beginner dart players with the standard way of throwing. The throwing lines are not easy to see, however, as they are in black colors. Size: The bulk of the dart mat is 117 inches large, 24 inches wide and 1/4 inches in depth. It is the ideal size for home use. Besides, the non-slippery feature offers some level of comfort and confidence to the dart player – this results in a better throwing experience and performance for the player. Perfect for soft tip darts. Not good for steel tip Darts. Final Thoughts: This dart mat would be an ideal choice if you are not a steel tip player. Its quality and design guarantee a great, comfortable hitting experience at all times. The Viper Defender Dart Wall Protector provides protection for 8.2 square feet of your wall. Besides protecting, it also adds to the beauty of the wall where you place it. You can install any standard 17.75 bristle dartboard on it – note that it will not fit 18″ dartboard. This large dartboard surround with 1-inch deep high-density v foam ensures that its quality is high. The velvet surface is not only attractive but also very easy to put on. You can use it for a long time, as it is designed with durability in mind. Besides, the reverse side can be used when the main part becomes affected by frequent dart hitting. Great protector for the wall. Not suitable for up to 17.75 inches dartboard. This dart mat from Winmau is constructed with Soft fiber and rubber underlay. It gives a great comfort when you stand on it. The accumulation of different layers ensures it’s of good quality. There are four oche lines embossed near the bottom of the dart mat. It is perfect for both soft & steel tip darts. The design of the dart mat and throw lines make the mat versatile. Besides, it is lightweight, easy to roll up and store anywhere. Measurement doesn’t meet for the tournament. Final Thoughts: If you are a home dart player and play with soft tip darts then this is the dart mat you need. Previous article What Type of Dart Barrel Should I Use?